Data-only provider, Internet On The Go, has just made some big changes to its Hotspot Plan lineup. While there are some plans that have reduced prices, there is another plan that now comes with twice as much data. Apart from the price difference, the old plans available on the Sprint MVNO were called "Forever Data." What this means is that the pay as you go plans included data that never expired. They were able to last as long as it was fully used up. Not to mention, there were no monthly commitment on those plans. Today's changes, however, bring a new structure to Internet On The Go's plans. Instead of lasting "forever", data on the new plans now only last up to 30 days. Any data left unconsumed after 30 days will be expired. But if you use up the allotted data before the 30 days is over, you're free to add more data by buying more data. You can use this D-Link Mobile Hotspot device that can connect up to 8 Wi-Fi devices. It comes with a 1,450 mAh Li-Ion battery. The mobile hotspot is a sleek device with a pocket-sized specs, making it the perfect pocket-sized device you can bring with you anywhere you go. 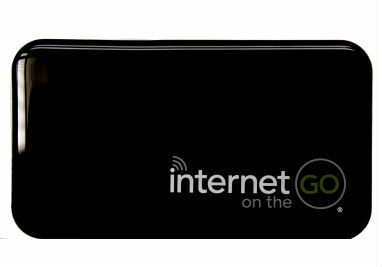 The other mobile hotspot device available from Internet On The Go is the Novatel MiFi 2 4G LTE Wi-Fi Mobile Hotspot. It comes with a battery that can last up to 11 hours of use and can connect up to 10 Wi-Fi devices. The device has 25 channels YIP TV and has an external memory of up to 32GB. Its dimensions are 10 x 7.3 x 0.9 cm. The original price of this mobile hotspot device is $199 but you can buy it from the MVNO for only $39. The Franklin R850 Mobile Hotspot device has a size measuring 3.5 x 2.6 x 0.5 inches. In front, there is a 128x36 pixel OLED display. As a mobile hotspot device, it can connect up to 10 Wi-Fi-enabled devices. Its 2,450 mAh Li-Ion battery can also be recharged so it can be used once again. If you sign up with service from Internet On The Go and enable auto pay billing on your account, you can get up to 1GB of free data that you can use. Again, you'll have to use up this data within 30 days, otherwise it will expire. To know more about Internet On The Go, click here. Update (3/8/2018): Added $40/month hotspot plan option, changed D-Link DWR-300 device to brand new, and added Franklin R850 Mobile Hotspot. Is there any reason I'd take this service over $20/mo. unlimited on Sprint with a service like 4GCommunity or as low as $10/mo. for low income qualified persons via a group like PCs for people? Some require payment up front for a year service to get the best/lowest rate but other than that I don't know why I'd go for something like the above. You'd go with something like the above because one company you mention isn't even taking new customers right now. The other requires you to be below the 200% poverty level to qualify for service. There are no requirements or contracts with IOTG. Just signed up with a different nonprofit like 4GCommunity, no income restrictions, finally cut the last bit (Internet) of cable co. teat. Elderly MIL qualified for $10/mo. service. I think the service mentioned in the article is a ripoff, especially for Sprint network. Going to share where you got such a deal, or did you just come here to boast? As they say, "proof or it didn't happen." 4GCommunity is folding - taking down with it the numerous one-year advance purchases of services made by many people. Dennis please cover! Details are on Howard Forums. They were evidently kicked out by the non-profit consortium for not being a true non-profit entitled to take part in the WinMax settlement of $10 a month hotspot service on Sprint. RIP internet on the go you will be on the go to bankruptcy as a company with this non-competitiveness real soon. Nobody really needs internet anyway. Its just another fadd. Ahhgreed! I'mma still waitin' ta see if this here texting thing ever catches on b'fore I buy me one a dem BlueBerry Phones. Why is hotspot internet remaining so expensive? Prices for hotspot-data hasn't come down like it has for phone data. There's an awful lot of off-topic salt in this comments section. Apparently the shills are buttflustered because AT&T and Sprint have gone down the crapper, and they're post-ironically taking it out on InterGo. With that said, this still looks like a terrible offer. With smartphones and unlimited data plans being a thing, carrying around an extra device (plus charging accessories) is downright inconvenient. That, and paying for small increments of data just isn't that economical unless you're not doing much of anything in the first place. The most damning aspect of Intergo is that it's on Sprint's native network, which means that you'll never even get coverage outside of any other carrier's service area, so your hotspot won't even be a reliable backup in case of dead zones. A smartphone on an unlimited plan is just a much better alternative, although you can just as easily go with a Surface Pro instead. Yeah, they're dead when MintSIM offers 5GB/mo data (no hotspot limit I've encountered) AND unlimited phone service for essentially the same $20/mo (admittedly you have to prepay 3 months, but that's no deal-breaker for most - especially when these guys are forcing you to buy their hotspot). I have this and it is GSM(T-MO) It works pretty good. I am using the Novatel. It is for mobile when using my laptop. It is pretty fast anywhere between 15 and 42 depending on the area. Most real world laptop usage exceeds 100GB, and if you already have Wifi available then you don't need a hotspot. Likewise, if you have a smartphone on an unlimited data plan, then you don't need a hotspot for mobile usage either. And if you're already paying two separate bills for home and mobile internet, then hotspotting will needlessly add a third. The only actual broad market appeal for hotspotting is as a wifi replacement. But since carriers don't want hotspotters or cordcutters on their networks, they'll never offer a good deal for the average consumer. That's ultimately what makes Intergo such a bad deal, as the supply fails so completely to address real world demand that it's downright useless to all but a few. It'll get even more obsolete as the market moves to a single unlimited data bill for multiple devices, with the number of allowed devices possibly becoming the main differentiator in pricing. The point is, you're in an extreme minority if you can find any use for extremely limited hotspotting in an increasingly data hungry world. My primary use of hotspot is so that I can use my laptop and my wife can use her WiFi-only iPad when traveling and also for me at developer and press events where WiFi is often overloaded and unusable. Our hotspot use is infrequent and usually less than 100/MB per day for the 10 or fewer days per year that we use it. There's usually no extra cost for domestic as we use our phones as hotspots and rarely exceed our data allotments. When traveling internationally I pick up a local sim and add funds as needed. As long as I can use my phone as a hotspot, I've never seen the point of a stand-alone mobile hotspot. Do you have any international prepaid SIM writeups or recommendations? I'll be visiting Italy this winter. I can probably live with a data only SIM, but I can't see making it without google maps / nav! I use prepaidgsm.net to research plans and prices available in the countries I plan to visit and then buy a SIM on eBay before I go if possible or at a cell phone shop when I arrive. Last time I was in Italy, Wind Mobile was the best deal, but that was years ago. What happens when the data is used. Does it stop or throttle at 128Kbps? I carry a MI line and Hotspot as it's better on my phone's battery and easy to use. I do use the phone's Internet sharing now and then. For those wondering about the other place a non profit can buy sprint mifi, check Mobile Beacon. And use Tech Soup for best pricing. They have baited people for years selling "forever data" (remember it used to cost double the monthly rate data) - and now take it away with no notice to any customers. Truconnect and Internet-on-the-go are outright criminals. Even tello is cheaper and comes with unlimited 2g after the data runs out. I am not a fan of Freedompop, but even them I would use over this. Now if they had a $5 tier with 200MB and unlimited at 128Kbps, I would consider them. These companies need to learn that they need to either offer a very small amount of data with unlimited 2g or unlimited high speed. That is where the market is today. Mobile Broadband plans do not generally include unlimited throttled data. Mobile broadband is a niche market and is much less competitive than the market for mobile phone plans with data. Using your phone as a hotspot is the most cost-effective way to get mobile broadband. I was spoiled with Clear Spot (WiMax). Unlimited 4G for $35/month (throttled to 1.5). $50 for unlimited full speed. Many GB used with no issues or complaints from Clear. Sold my used Spot for $85 about 6 months before they closed for good - people still wanted to watch lots of movies. I think I paid $50 for the modem, new. Well, it was nice while it lasted, but with data expiring every month you must either pay them $10+ monthly or whenever you need to use them. Not really worthwhile anymore, for me.